Want to almost instantaneously put a Mac to sleep from your external keyboard? It’s much easier than you’d think, and you don’t need to pull down the  Apple menu to accomplish this task. 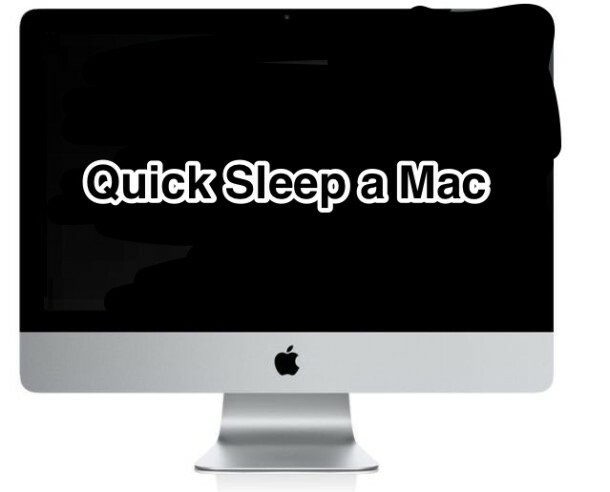 Instead, to quickly sleep your Mac just hold down Command + Option + Eject for about two seconds, and the computer will immediately enter sleep. This works well when you’re using a USB or external bluetooth keyboard with a MacBook Air or Pro, or the wireless keyboard that comes with an iMac or Mac Mini. For newer Macs without an Eject key, the power key will serve the same purpose. Just remember that if you enter the wrong keyboard combo (command+control+power) you will end up instantly shutting down the Mac instead of sleeping it. Assuming you have auto-restore window and auto-save enabled with OS X Lion, Mountain Lion, Mavericks and onward, that shouldn’t be a big deal beyond being an inconvenience, but it’s certainly something worth paying attention to. Another popular approach is to use a hot corner for inducing sleep immediately, but that’s easier to accidentally trigger than a keyboard shortcut. Similarly, if you have an Apple Remote you can use that to sleep a Mac too.